Hermann von Helmholtz (1821-1894) was the absolute master of the natural sciences of his day. He both dominated and understood. His first great achievement, in 1847 at the age of 26, was to formulate the principle of the conservation of energy. Helmholtz also demonstrated great practical talent by inventing the opthalmascope, and his «Theory of Sound Sensitivity» (1862) both propounds a theory for the combination of tones and analyses the timbre of musical instruments, even venturing toward a theory of harmony. His famous «Manual of Psychological Optics» appeared between 1856 and 1867, with the English translation appearing 60 years later to world acclaim. Here, Helmholtz introduces the three variables which are still used to characterise a colour: hue, saturation and brightness. He was the first to unequivocally demonstrate that the colours which Newton had seen in his spectrum are different from colours applied to a white base using pigments. The spectral colours shine more intensely and possess greater saturation. They are mixed additively, whereas pigments are mixed subtractively. In each case a different set of rules governs their combination. 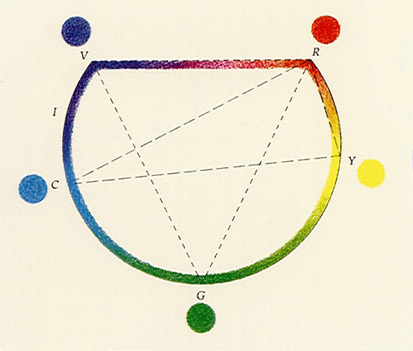 In line with Thomas Young, Helmholtz also advocated a three-colour system, and demonstrated that each colour could be composed as a mixture of three basic colours — for example red, green and blue-violet as the so-called «simple colours». 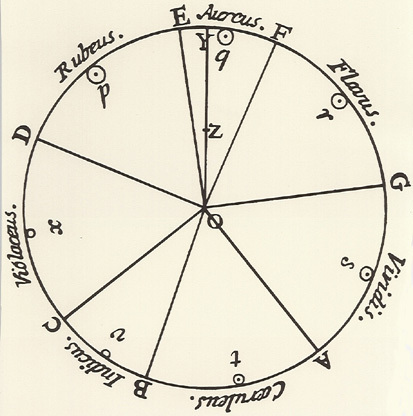 In his manual, the great physiologist then submits several proposals for the arrangement of these simple, or pure, colours — thus covering the entire spectrum. He also attempted to intervene — rather casually, but nevertheless vividly formulated — between Newton and Maxwell. For Helmholtz, Maxwell’s triangle is too small to accommodate the saturated spectral colours and Newton’s circle does not explicitly refer to the trichromatic theory, which contains a deep insight. Helmholtz first of all arranges the spectral colours on a curved line in order to achieve a better understanding of their mixtures. He imagines a kind of force field of colours — the colour field — with white in the middle, corresponding to Newton’s gravitational centre. Helmholtz noticed that in order to obtain white, he did not require equal quantities of violet-blue and yellow, for example. He thus arranged his colours in such a way that those complementary colours which were required in greater amounts were given greater «leverage». Newton’s circle forms the basis of a second construction by Helmholtz in which two triangles are plotted after omitting the part which intersects the line between red (R) and violet (V). This truncation is only possible without detriment because the two colours concerned mark both ends of the spectrum. (at the CIE-system we will encounter this line once again as purple.) 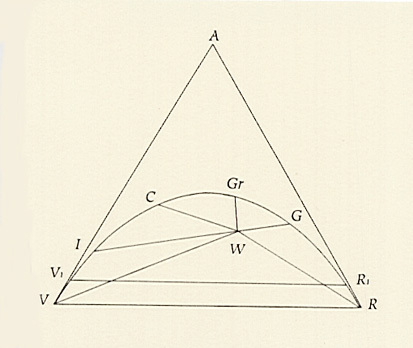 In the figure, we are left with two triangles whose corners have been determined in each case by the two possible combinations of three basic colours, between which Thomas Young had wavered at the beginning of the 19th century. The triangle with the violet, red and green (VRG) corners thus contains all colours which are formed from mixing violet, red and green, and the same applies for the red, yellow and cyan cornered triangle (RYC). It is apparent from the figure, and also from Maxwell’s triangle, that not all colours can be recorded in this way, and that a large portion of the colour-circle remains remote. There was, of course, no doubt about the trichromatic theory in Helmholtz’s time, and this encouraged the belief that there really must be an ideal triangle with a place for all the mixed colours of the spectrum. With his remaining construction, Helmholtz returned to that first curve of simple colours which he had drawn on the assumption that quantities of light of varying colour can be regarded as being the same when, at set intensities, they appear to the eye as equally bright. Based on the pure basic colours of red and violet, without further explanation Helmholtz moves the point representing our perception of pure green to A, to form a triangle AVR which now contains all sensations of colour. Subsequently, Helmholtz draws the conclusion that, in his view, the pure red and the pure violet of the spectrum do not occur as a simple sensation of a fundamental colour, and for this reason the lower line must be displaced to the values V1 and R1. The colours which can be directly attained by means of light entering a normally sighted eye will then lie on the closed curve V1ICGrGR1 (the abbreviations refer to indigo, cyan, green and yellow). The triangle otherwise contains colours which are located at a greater distance from white, and are therefore more saturated than all customary colours. Helmholtz and Maxwell concentrated on selecting the most suitable diagram to explain the observed facts with regard to colour mixtures. 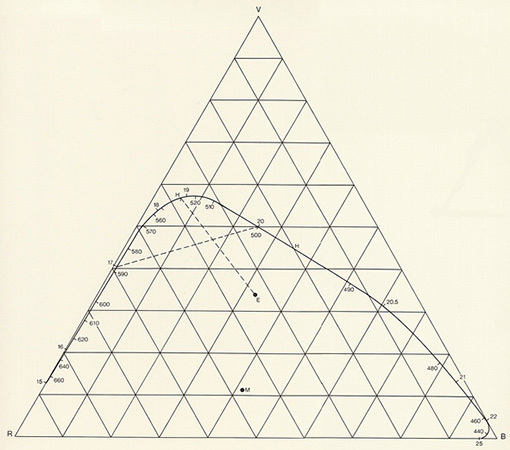 Because the trichromatic theory was both available and accepted, their attention was turned towards the geometry of the triangle, without any consideration of the phenomenological aspects. 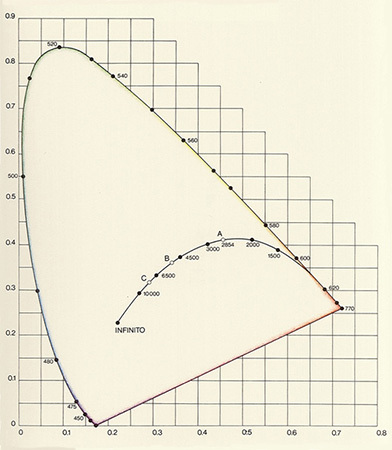 The question concerning the position of the spectral colours in each triangle was only finally resolved at the end of the 19th century when A. König and C. Dieterici examined «the basic sensations in normal and anomalous colour systems and the distribution of their intensity in the spectrum» and specified the course of the line which we have plotted in Maxwells triangle. This will only be scientifically correct if we imagine an ideal triangle whose colours possess greater saturation than the spectral colours (E marks the point of equal energy, and this can be also interpreted as white). The results of the spectral mixtures illustrate how Newton had simplified matters when he assumed that the saturation of mixed colours will be less if, within the sequence of colours, their components are located further apart. The work of König and Dieterici appeared in the «Zeitschrift für Psychologie» in 1892, and it was evident that the pre-eminence of colours had become lost to contemporary physicists. But the power of perception will in the end prevail; without it, the technical game with colours would remain all too trapped within geometrical constructions, even when practiced by a genius like Helmholtz or Maxwell. 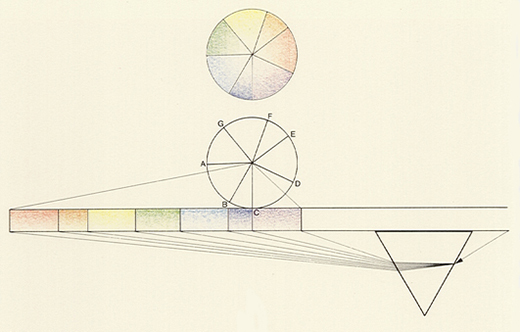 Date: The colour diagram appeared in 1860 in the now famous Manual of Psychologocal Optics. Bibliography: H. von Helmholtz, «Manual of Physiological Optics», Volume II, Section 20 (1860); A. König and C. Dieterici, «Die Grundempfindungen in normalen und anomalen Farbsystemen», Zeitschrift für Psychologie 4, pp. 241-347 (1892); E. G. Boring, «Sensation and Perception in the History of Experimental Psychology», New York 1892.